Good news! This morning the Federal Reserve announced that capacity utilization is ticking back up, a sign our idle factories are starting to hum again. The bad news: as shown by the blue line, even during boom times, peak capacity utilization continues to trend lower, and has been since the peak in the late 60s. 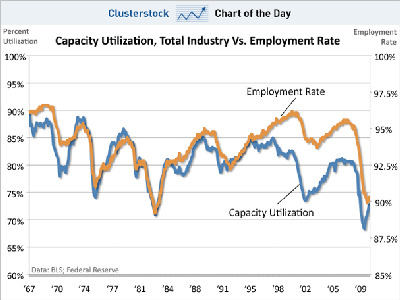 What’s interesting is that capacity utilization and the employment rate used to be tightly correlated, but the employment rate during the last two peaks looked much stronger than what the capacity utilization rate might have predicted. The last two peaks were also major bubbles (.com and real estate). Bottom line, if historical trends stay in place, capacity utilization won’t even rise to the last level of the last boom. So if we want anything approaching full employment, you better pray for another economy-distorting bubble.